For the past twenty years I've traveled the world photographing children trapped in child labor, forced labor and human trafficking but nothing prepared me for the the children of Bal Ashram. Rescued from slavery by an extraordinary couple, Nobel Laureate Kailash Satyarthi and his wife/partner Sumedha Kailash, the children of Bal Ashram have seen their dismal life-fortunes reversed and have created a family with others of every caste and creed at Bal Ashram a refuge in Rajasthan India, where they've rediscovered freedom, love, acceptance and pursued the education they need to move forward with their lives. Once human slaves victimized by organized crime, these boys and girls now have found their voices and become shock troops in a global campaign to end human slavery and child labor. They know better than anyone that children's rights are human rights and so they have transformed themselves into ambassadors to the world for those children still left behind. We spent two months in India in 2017 meeting these remarkable children, learning their stories and seeing their beauty, resilience and power emerge. We crisscrossed India as part of an 11,000 kilometer march to end sexual abuse and slavery as these former slaves took their calls for action to the Presidential Palace and followed the lead of Kailash and Sumedha... who have pioneered this work for the past 40 years. 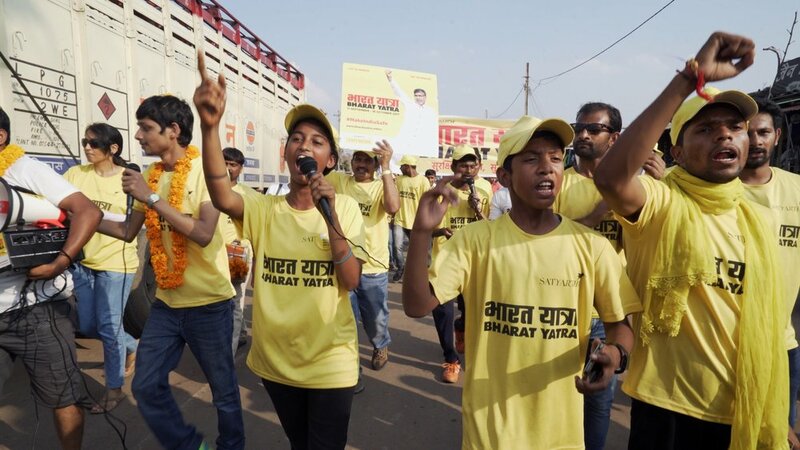 Over 5 million people joined this March for Children, but the children in the yellow jerseys were the core of the effort inspired, taught and led by their adoptive parents, Kailash and Sumedha. Behind their personal efforts is India's largest child rights movement, Bachpan Bachao Andolan that has rescued over 87,000 children from slave labor. Over 9,000 of these children have grown up, some spending a decade or more, living at Bachpan ashrams and finding the hope and dreams that today propel their futures. Children of Bal Ashram is a film inspired by and defined by the lives of former slaves. They are no longer victims, they don't accept that they should become statistics on a page. "Every child has a hidden talent". "Humans have created castes not God". "We should all help those who need our help" and most importantly, never sit on the sidelines... "Victory goes to those who roll up their sleeves and fight, don't wait on anything, Just do it!"